Life has been quite hectic of late, even more than usually. I didn’t get to have too much time in the kitchen this past weekend and that is when I usually do my recipes for my blog so this week will be about simple recipes. Sometime ago I must of signed up for a Betty Crocker newsletter, it has been popping up in my email for some time now. I don’t remember doing that, but anyway I have been enjoying the recipes that they feature in their newsletters. 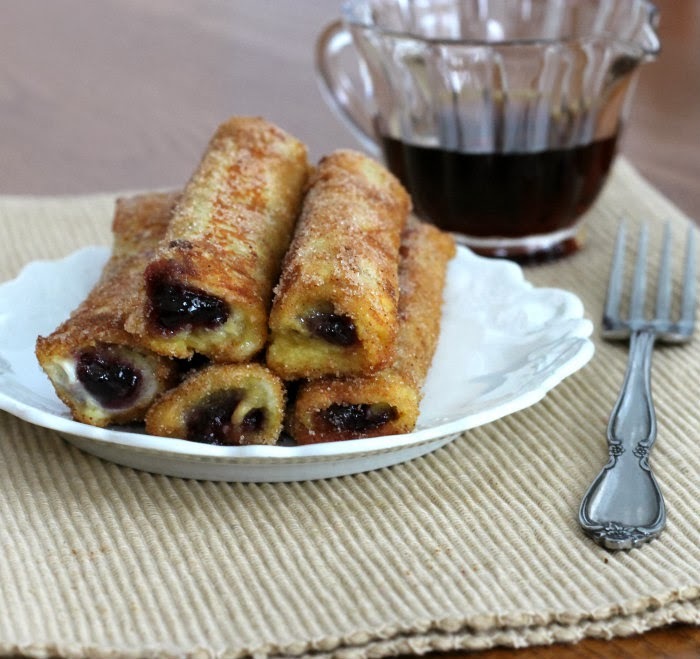 This is where I found this French toast roll-up, which are simple to make and oh so yummy. 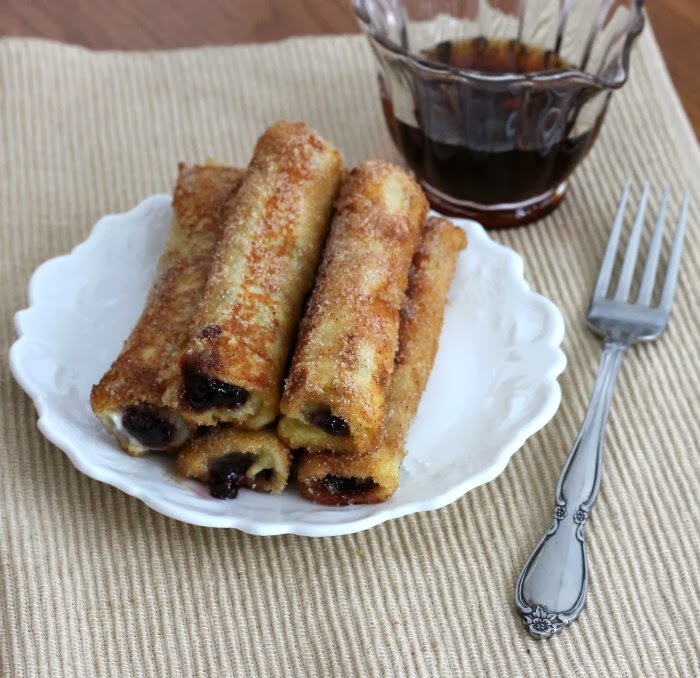 If you can believe this we have family members that don’t like French toast, but even those that usually turn up their noses at French toast enjoyed these roll-ups. You can use the filling of your choice which could be endless, but I used cream cheese and blackberry jam. They are simple to make and will certainly be a crowd pleaser. 1. Cut crust from slices of white bread and flatten bread with rolling pin. 2. Spread desired filling on about 3/4 of the side of each slice of bread, leaving about a 1/2 inch of the bread with no filling. Whatever flavor combination you would like. Tightly roll up the slice of bread. Continue until all the slices of bread are filled and rolled up. 3. In a shallow dish, beat egg and milk together. In another dish, mix sugar and cinnamon. 4. In a skillet, melt butter over medium heat to coat inside of skillet. Dip each roll into egg mixture and place in skillet. Cook in batches of 3 or 4, turning until rolls are browned. Dip into cinnamon sugar and roll until completely covered. Serve immediately. Can eat as they are or the can be served with maple syrup. Wow, what a great idea. And they’re so pretty. This is the way I’d do French Toast for company. 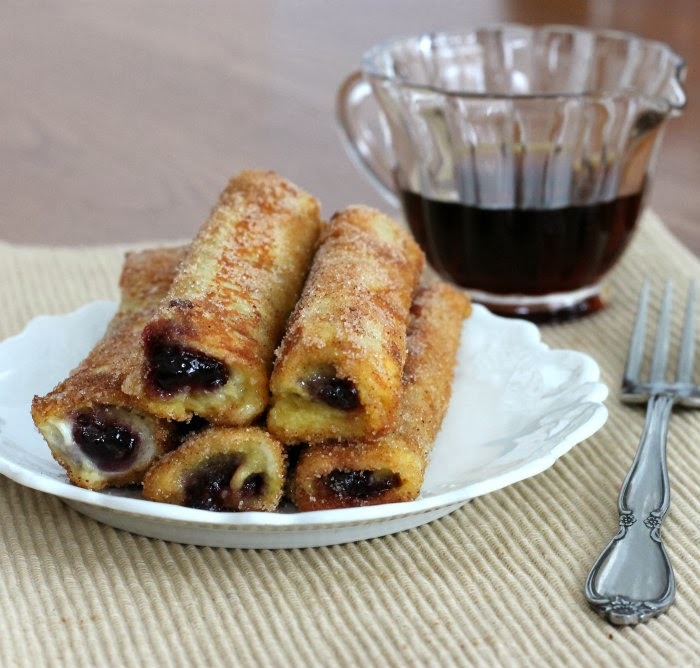 Well, I can’t imagine not liking French toast…but I can DEFINITELY imagine eating a whole batch of these roll-ups. YUM. How can you not like French Toast? 😉 Anyway, this dish will probably convert them — it looks so tasty, and quite easy. Good stuff — thanks.